Despite the fact that we had every intention on T being an early swimmer and having lots of confidence in the water, things didn't really work out like that. 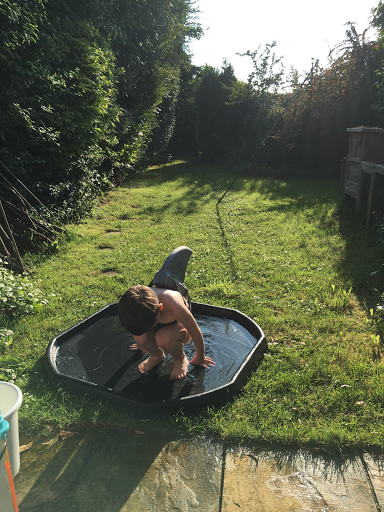 Although he absolutely loved the water and going swimming, as soon as he got out of his comfort zone, he lost all confidence, gets upset and basically clung on to the closest person at all times! 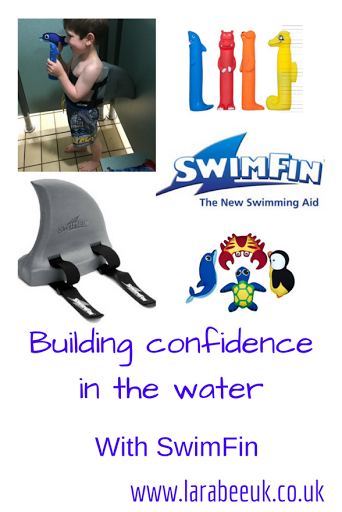 We knew that we needed to stop this in order for us to take T to swimming lessons and for him to be able to learn. 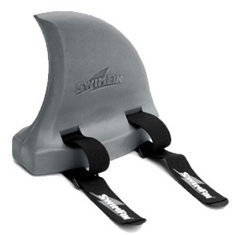 Queue, the SwimFin, I must admit at first I thought they were just a fabulous toy. I had no idea that something so appealing to children could possibly be a learning aid! 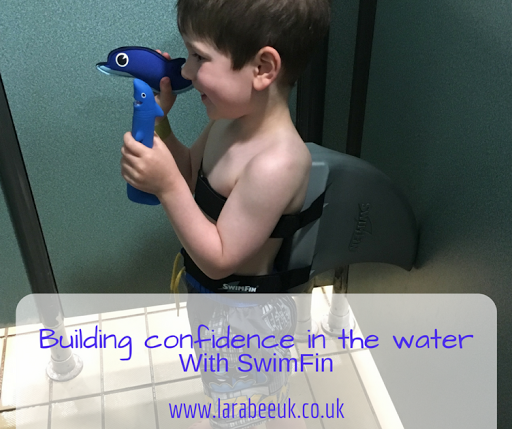 In my opinion the SwimFin is a fantastic aid to keep children buoyant in the water, enabling them to feel the experience of swimming, but without clumsy arm bands or rings. We're really hoping that in time the SwimFin will give T the freedom in the water that he currently doesn't have. We've been getting in lots of practice in the garden, both on land and in (a tiny bit!) of water. 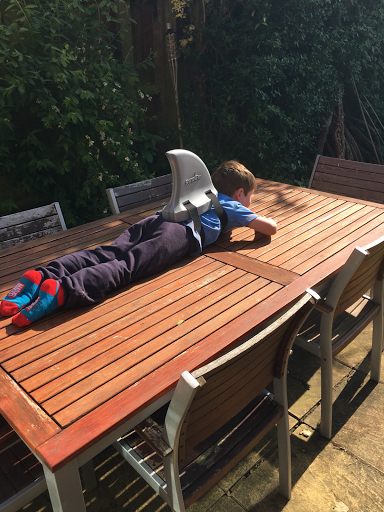 Not only is the SwimFin a wonderful floating tool to help children learn to swim but it is also a fantastic prop for playing! We've had many a game of shark chase since we got it! The SwimFin comes in an array of lovely bright colours, as well as shark grey (which we went for) and killer whale black. They are £21.99 which I think is really good value. 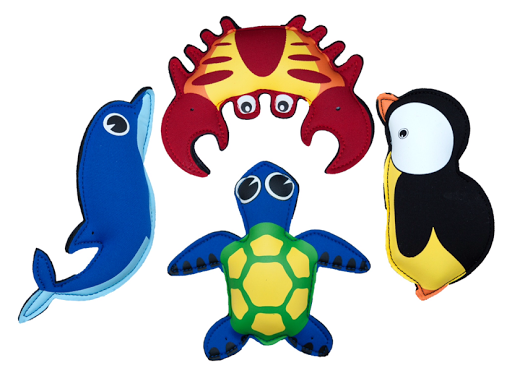 As well as the SwimFin, we were sent funky floaties to also try, made from durable neoprene the pack of 4 cute sea life characters are great for helping children to go that little bit further than they usually would go, without realising that they are going out of their comfort zone! T loves them! We've used them in the paddling pool, bath and swimming pool! They retail at £9.99 and come in a handy little mesh bag. 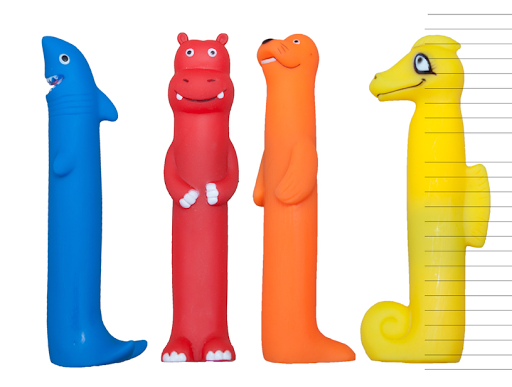 We were also sent a set of dinky divers, these weighted rubber toys are great for dropping to the bottom of the pool for children to 'dive' down to retrieve. T is still to actually put his head under the water to grab them but he's getting there slowly, I, sure it won't be long before he's diving down to get them without any concern! 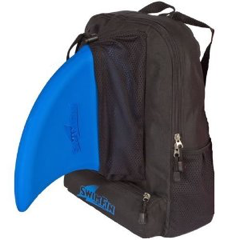 I absolutely love this fantastic back pack It's available *HALF PRICE* in the SwimFin shop at the moment, absolutely perfect for taking your SwimFin and other pool 'toys' to the pool! In fact I've just ordered one for T! It's now down to £5.49 with free shipping! While you are over on the SwimFin website, check out the Finlay Club and make sure you register your child, there are online games and colouring pages for them! Disclaimer: we were sent these products in return for our honest review, all opinions are our own. What a great idea to gain confidence in the water. I still remember that horrible feeling of going under when I was little! !